The Samsung POWERbot Wi-Fi Cleaning Robot Vaccuum and the Samsung POWERbot TURBO Cleaning Robot Vacuum is available for new customers to try out in their homes under a 30-day trial period at www.trypowerbot.com. 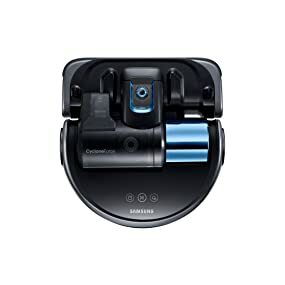 If you’ve always wanted your very own robotic vacuum because of all of the benefits it provides then the Samsung POWERbot is definitely worth your consideration via this online deal. You can buy the Powerbot on Amazon here. Both vacuums are available on Amazon.com with great reviews and comparable pricing if not cheaper. Out of over 30 customer reviews left on Amazon.com the vacuums are highly rated with a customer rating of 4.2 out of 5 stars. Click To Read Reviews!! The price of the vacuum is $699 and included in the deal is a $100 instant savings and a $100 reward certificate. The free $100 reward certificate is an e-certificate awarded to customers who purchase the Wi-FI Powerbot from www.trypowerbot.com after keeping it for 30 days. The certificate is emailed to customers on the 31st day and can be used towards the purchase of any eligible item on Samsung.com. This e-certificate offer is only valid from 10/07/2016 til 12/31/2016. The Samsung Wi-Fi Powerbot also comes with a 1 year warranty and customers can take advantage of a credit line through Paypal Credit which is available to customers in 2 offers. The first offer is no payments and no interest if paid in full within 6 months. Customers don’t have to make any regular payments in between the 6-month time period and to avoid interest they’ll need to make sure the balance on the vacuum is paid off at the 6 month mark to avoid interest charges. The 2nd offer provided by Paypal Credit is customers can take advantage of a 6 month or 12-month payment plan with 0% APR. The 6-month plan is $116.66 per month with a minimum purchase amount of $180.00 and the 12-month plan is $58.33 per month with a minimum purchase amount of $360.00. Customers can visit Amazon.com and take advantage of the free shipping options and of course Amazon Prime customers can receive the 2 day shipping option. Click For Powerbot Best Pricing!! The online price of the Turbot Powerbot is $999.99 and included in this deal is a $100 reward certificate and $200 instant savings. It likewise has the sends customers a $100 e-certificate after purchasing the product that has the same details as the Wi-Fi Powerbot. 1st offer: No payments and no interest if the vacuum is paid in full in 6 months. Customers don’t have to make any regular payments during the 6-month time period but the vacuum should be paid off at the end of the 6-month period to prevent owing interest charges. App: Via the free app on your smartphone or mobile device you can control the Samsung Powerbot from the Wi-Fi control allowing you to initiate vacuuming while you’re away from home. Performance: It has the same performance of an upright vacuum with similar design features such as 12-inch wide brushes and sturdy rollers coinciding with the powerful motor. Cyclonic Force Separation System: This design feature creates a strong centrifugal force that creates a spiral action separating larger dirt into an outer holding chamber which assists the vacuum with maintaining deep suction longer without clogging. Suction Power: The Wi-Fi Vacuum has 10 times the suction power of its competitors while the Turbo Powerbot offers 70 times more suction power. It’s designed to increase suction power around corners and cleans corners up to 3 times to ensure area is cleaned. Smart Filtering: The filter is washable and easily maintained. There is a large transparent 0.7 liter dustbin to collect the debris which you can see when it’s full and needs to be emptied. Wheel Design: The vacuum has easy pass wheels and an automatic suspension that will maneuver over different floor types including area rugs and wall to wall carpeting with ease. Visionary Mapping Plus and Full View Sensors: maps your house to clean from room to room in a methodical back and forth pattern while minimizing bumps and scratches on furniture. Full View Sensor: senses and navigates around chair legs, toys, shoes, pets, or anything else in its way. Has a stair sensor preventing the powerboat from falling down the stairs. Automatic Return to Charger: Automatic Returns to Charger after cleaning and when battery is low. Cleans up to 1500 sq foot on a single charge in about 60 minutes.